Kale is ubiquitous. I see bumper stickers and t-shirts saying “eat more kale” and restaurant menus with bruised kale, walnut and whatever salad, kale this and kale that. Next, we’ll hear that renewable energy can be extracted from kale. One can hope. But seriously folks, with heavy rains and strong wind gusts blowing outside my kitchen window – the remains of Typhoon Songda hitting the Pacific Northwest – today is the perfect day for figuring out how to make the best kale chips. A nice, safe indoor activity, at least while we still have electricity (if only kale was also an electrical powerhouse and not just a nutritional one). Kale is one of the staples in my organic garden. With the cooler weather my plants are reviving, and I find it’s a good time to get creative with the plentiful leafy green. Makes four batches, or 4 -6 snack servings. Total prep and baking time: 40 to 50 min. Preheat oven to 350˚. Wash the kale and drain. Using a paring knife run the blade upwards against the stem at an angle to easily remove the leaves. Wash kale leaves and spin dry in a salad spinner. Tear leaves into bite sized pieces and place in a large bowl. Line a baking sheet with parchment paper. Add the olive oil, salt and melted honey to the bowl. Sprinkle chili powder over leaves (its spicy, so don’t overdo it). Toss together. 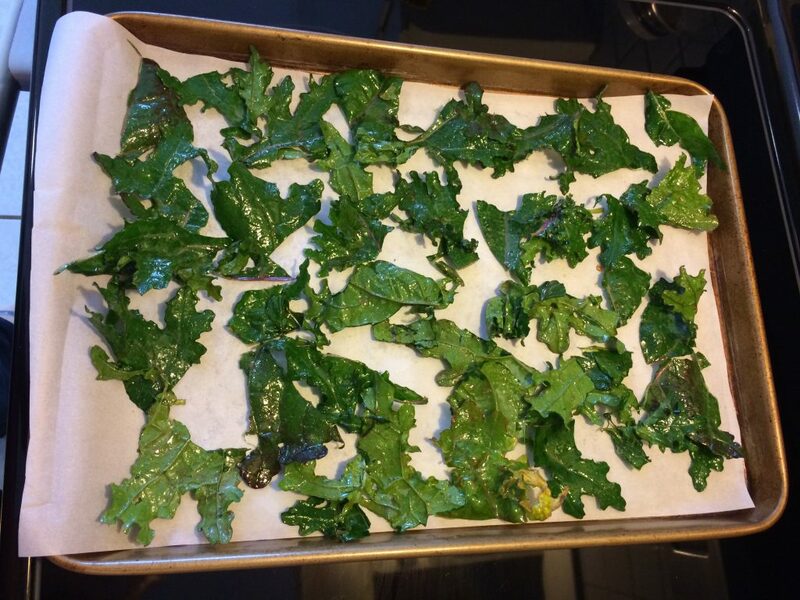 Spread coated kale leaves in a single layer, one batch at a time, on the baking sheet. 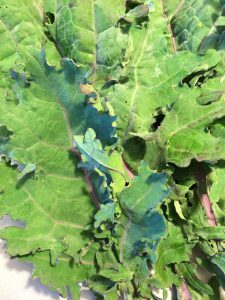 Bake kale for 9-10 minutes or until leaves are crisp. Serve immediately, or place baked leaves in an airtight storage container for snacking later. I used the same piece of parchment paper to cook all four batches.